OneIndia Entertainment, “India’s #1 Language Portal”, reports that the long-delayed Hindi-language Koochie Koochie Hota Hai feature, supposedly completed in 2009 or 2010 but release-delayed (because of poor box-offices in India for Indian-made animated features) until December 10, 2012, has been postponed again until July 2013. The feature, a CGI-animated funny-animal remake of the hugely popular 1998 Hindi live-action Bollywood feature Kuch Kuch Hota Hai, is an anthropomorphic sci-fi (time travel) romantic comedy-drama with lots of singing & dancing. See Flayrah's April story for more details, or watch the English-language trailer. Animation Xpress, vol. 10 #371 for October 4 reports that Delhi Safari, the CGI animated feature about an angry monkey, a laid-back bear, a scheming parrot, a mother leopard, and her cute cub trekking across India to the human city of Delhi to protest the strip-mining of their forest, will release on around 300 screens across India on October 18. The Hindi-language feature has a strong Bollywood voice cast. Animation Xpress has a long interview with Krayon Pictures’ Nishith Takia that shows its poster and new promotional art. “Our film has got screened at Annecy International Film Festival and has also won the best Animated Feature Film at FICCI FRAMES in India, has boosted our confidence in the way the film has come out.” The film has a positive School Contact program at over 3,000 schools across India because of its strong pro-ecology message. Delhi Safari has been dubbed into English with an all-star cast (Jason Alexander, Cary Elwes, Christopher Lloyd, etc.) for an American release sometime during 2013. Its English-language trailer was shown on Flayrah last May. Gods, yes. Dragons, yes. Monsters, yes. Giants, yes. Anthropomorphic animals, … eh. You might still be interested in this 2+-minute 3D stereo trailer for the Krishna aur Kans animated feature, slated for release on August 3, a week before this year’s Janmashtani (a major Hindu religious holiday to celebrate the birthday and youthful adventures of Krishna, an avatar of the god Vishnu). Directed by Vikram Veturi, the movie chronicles Lord Krishna’s early years, from his birth as the nemesis of his tyrannical uncle Kans, to his combat against demons at the age of 10. 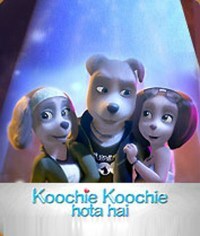 Koochie Koochie Hota Hai, the long-delayed Hindi-language anthropomorphic sci-fi (time travel) romantic comedy-drama (with lots of singing & dancing) animated feature film, is finally scheduled for release in India: December 10, 2012. The movie is a CGI-animated anthropomorphic remake of hugely popular 1998 Hindi live-action romantic feature (with lots of singing & dancing) Kuch Kuch Hota Hai. Completed more than four years ago, the failure of Roadside Romeo in 2008, India’s first CGI-animated funny-animal feature, caused Koochie Koochie Hota Hai to be shelved – until now.